Cleaning woman and war widow Hilda Capper realizes on her birthday that her life is better than that of her employers. A husband who had divorced twice because he had been betrayed by his former wives, takes his precautions to prevent the did to happen a third time. And yet it does. 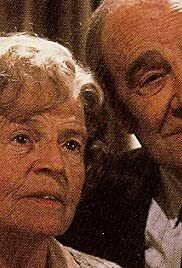 Mrs. Capper's Birthday is based on a story by Noel Coward. It's about a woman (Patricia Hayes) who was widowed during the war but continues to speak out loud to her husband. Today is her birthday, and she starts off by cleaning the home of a married couple and supporting the lady of the house as she tries to get her lover out the door before her husband comes home. The husband calls and tells Mrs. Capper that he'll be home in half an hour. Then his wife comes downstairs and pretends that he's upstairs. Finally she asks, "Did I hear the phone? Who was it?" "Mr. Nash," Mrs. Capper said. "He wanted you to know he'll be home in a half hour -- 29 minutes now." Mrs. Capper lives with an egomaniacal, boisterous woman named Alice (Avis Bunnage) but she holds her own against her just fine. Alice is suspicious that her gentleman caller is after Mrs. Clapper, and he is, but she turns him down. That evening her daughter and son-in-law take her and Alice to dinner, followed by a pub where a friend of Mrs. Capper's performs. Mrs. Capper herself takes the microphone and sings I'll Be Seeing You, but a brawl ensues and she stops singing. She's pulled in all directions - her daughter wants her to move in with her and her husband, she has a proposal of marriage, the woman she cleans for adores her and has given her an expensive gift - but in the end, Mrs. Capper wants to be alone with her memories of a marriage that was too short. Not much to this film, but so well acted and a very sweet story about a day in the life of an old woman.